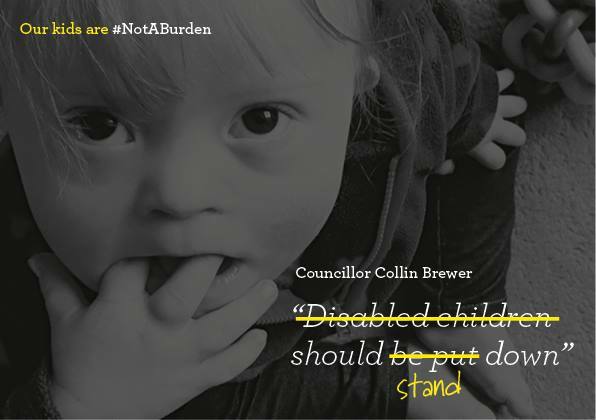 Many of you will be aware of recent comments made by Councillor Collin Brewer regarding disabled children. I'm not quite as eloquent as many other campaigners when it comes to 'fighting the fight' peacefully and with dignity, so my contribution comes with the image below. To be honest I've 'err-med and ahh-ed' about what I should do and I'm still not too comfortable with tarnishing The Future's Rosie blog with his story, however the comments made were so vile, disgusting and out of touch it simply couldn't be ignored. Anyone new to The Future's Rosie who may have come here looking for some positivity please rest assured that the views of this man are a minority – our desire to call for his resignation comes from the fact he voices these small minded opinions from a position of power. I will remove this post when he resigns. Thank you for joining us. I too shall remove all trace of him from the blog when he resigns. This poster is simply brilliant Tom. Supporting you all the way! !